Some where around the turn of the century, a group of local people formed the Magazine Club. Early members were Dr. and Mrs. G. H. Gerhardt, Mr. and Mrs. James Cockrell, Mr. and Mrs. Kim Sedgwick. Mr. and Mrs. G. J. Burrer. Perhaps it was a literary club in the beginning but one of the club's projects was building a resort known as Camp Clifton. Summers were hot in towns and cities so it was popular to go to the country for cooler more relaxed living. New Yorkers went to the Adirondacks, Central Ohioans went to Camp Clifton. Plans began in 1909 to build the resort. The earliest mention of the camp is a note in The Sunbury News which stated The Magazine Club was opening Camp Clifton on July 4th 1910. Other names linked with the enterprise were P. W. Gage and Charles Wheaton. Located northeast of Sunbury at 12474 N. Old 3-C Highway along the Big Walnut Creek, the camp consisted of several cabins and a large dining room. 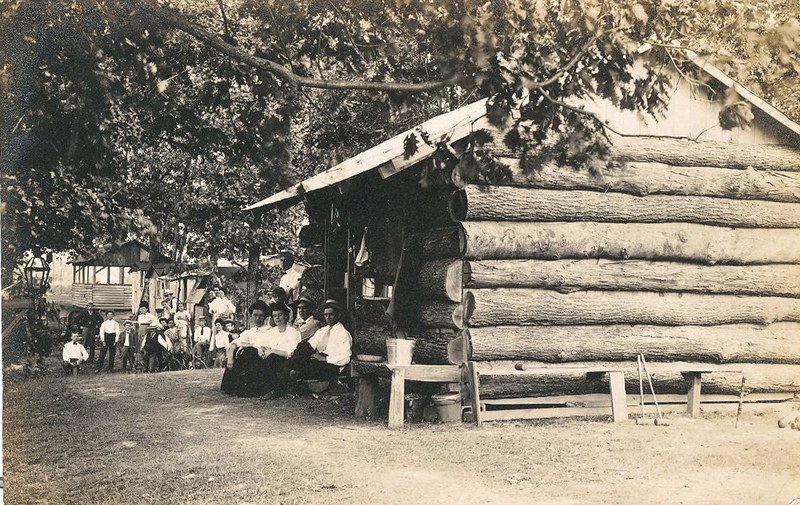 Picnicking, boating, fishing and swimming were some of the featured entertainments. A railroad spur provided access from the outside. Cooks were hired to provide the food. Families would go to the camp for a weekend, a week, a month or even a summer. Sunbury had a Community Picnic there August 38, 1918. All stores in Sunbury closed for the day except the restaurants which closed from 12:30 to 5:00. The Committee urged residents to "Bring your baskets well filled and spend the day with your neighbors." Seated in front row of the picture above are Minerva Hess Burrer, Mr. Hess, Gertrude Burrer Mrs. L. R. Smith, a Leemy girl, Daisy Burrer holding Carleton Burrer, Jakie Burrer, Gordon Burrer, unknown child, Mrs. Cockrell and Mrs. R. W. Gage. In the back row are Parker Burrer holding Gerald Jacob Burrer, K. O. Burrer, P. W. Gage, Magus a camp employee, Dr. Gerhardt, Mrs. and Mr. Leemy, L. R. Smith, Charles Wheaton, Otis Wheaton, Mrs. Cockrell, Mrs. G. J. Burrer, Mrs. Wheaton, a cook, Dean Cummings, and another cook. Camp Clifton ceased to be an exclusive resort around 1920 but continued to be used for civic events such as Sunday School picnics, cookouts and a great spot for hikers.